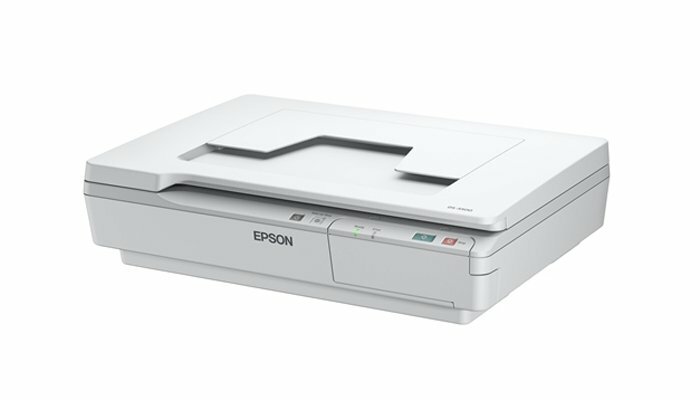 The Epson WorkForce DS-5500 is ideal for vertical market businesses who require easy document capture and conversion thanks to its high-quality CCD technology and powerful imaging features by Epson Scan and Document Capture Pro. This device is specially designed to accommodate documents individually, and is ideal for users with specific capture needs, such as scanning bound materials and thick or fragile documents. This scanner can be easily integrated into vertical applications thanks to TWAIN, ISIS and WIA support, as well as Document Capture Pro connectors. High-quality scanning results are ensured by CCD technology and innovating imaging features, such as Book Spine Correction, and improved colour dropout/enhance powered by Epson Scan. In addition, Document Capture Pro makes it easy to treat scanned data before its conversion and distribution in virtually any document repository or document management system. This scanner and its features can be shared between multiple users using the optional Network Interface Panel. Combined with Document Capture Pro solutions, the Network Interface Panel allows users to benefit from Push Scan features and customise ‘scan to’ job functions such as ‘scan to email’ or ‘scan to Microsoft SharePoint®’, among others. These features enable complicated tasks to be carried out effortlessly.